I tried to give some colors and some epicness to this tileset from Jerom, because I liked it. I used DawnBringer 32 color palette. SOme tiles can easily be recolored to your pleasure. I gave myself the 4 color per tile/sprite rule. Principally attribute this to Jerom. I just added some colors. Put Eiyeron or @Eiyeron. Used this for my Candy Jam game: Candy-Crushing Adventure Saga. Thanks for colorizing, and thanks to jerom for the tileset in the first place! 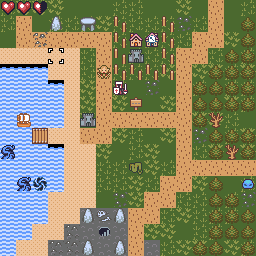 i had a game in mind using the original graphics but this colored tileset is sparking new ideas. I have a gameplay suggestion : could you add a mode for AZERTY keyboards please? thanks for the hint. I was unaware that WASD is not suited for every keyboard layout. I have added the arrow keys, since they are pretty universal, and a few more enemies from the set.